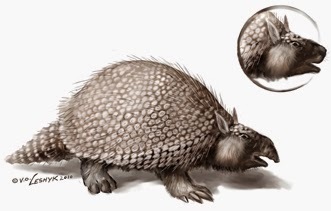 Amy saw an armadillo last week so she is now inspired to write about some of their extinct cousins, the glyptodonts. Glyptodonts were crazy cool mammals that lived during the Pleistocene Epoch from 2.58 Ma until they went extinct about 10,000 years ago, possibly from climate, disease, or from people over-hunting them and using their shells as emergency shelters. Talk about a fulfilling meal! They lived in South America and migrated as far north as Arizona and Texas during the Great American Biotic Interchange about 2 million years ago along with some other South American fauna, like our old friend Thylacoleo. This biotic interchange was the first time South America had come into contact with another continent since the breakup of Gondwana back in the Mesozoic, meaning that the South American fauna had ~63 million un-interrupted years of evolution all to themselves, which is why those endemic species are so flippin' WEIRD. 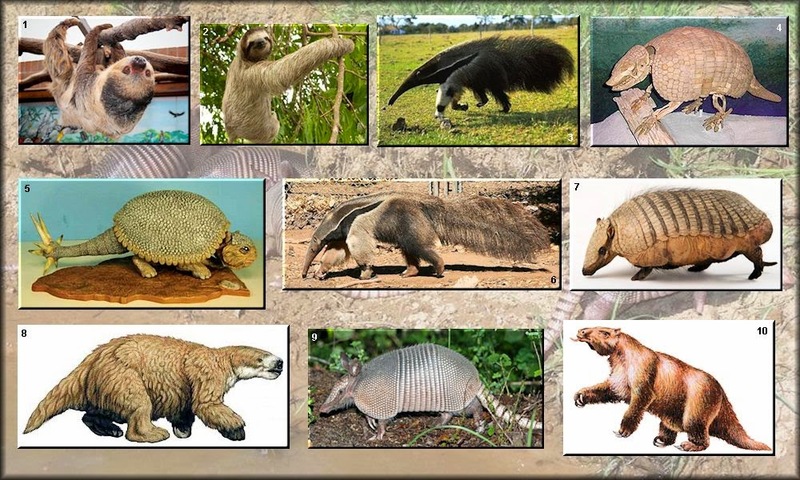 Glyptodonts are no exception to that rule and belong in the superorder Xenarthra along with sloths, anteaters, and armadillos, which of course means they are phylogenetically awesome. "Glyptodonts LOVED a good back scratch"
"Glyptodont ceviche is my favorite hors d'oeuvres, too!" "Who wants to play piñata?!" Seriously, how is this not pokemon. You may have noticed that the tails of all these bad boys aren't all the same. There were a few different genera of glyptodont, including the impressive Doedicurus with it's spiky club tail and Glyptotherium, which made the mighty migration north. But forget about the tail, at the opposite end of the body lies the true glyptodont controversy: trunk or no trunk? 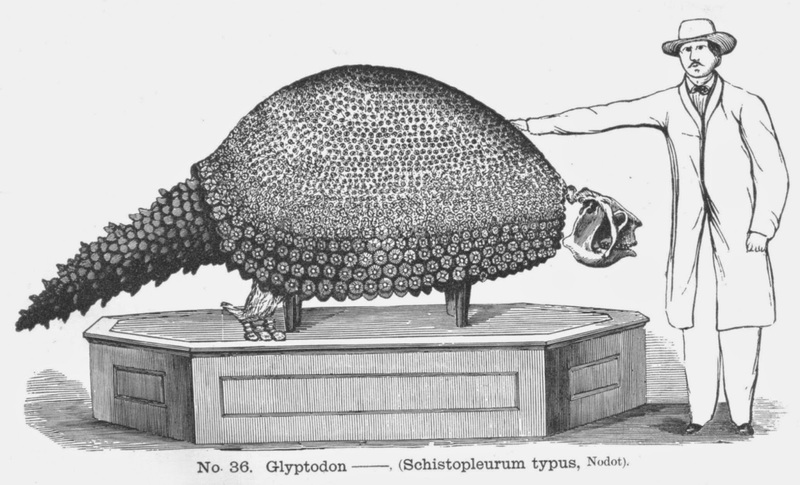 Some scientists support the idea that glyptodonts had a trunk because of its shortened face and bizarre expanded nasal opening, though no consensus can be made for the length of said trunk. On the other side of the argument are those paleontologists who believe the strange snout stems from the chilly climate of the Pleistocene. 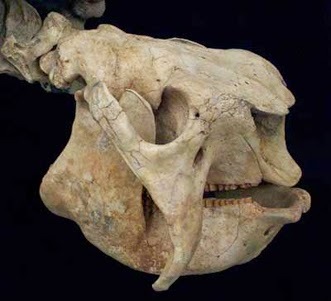 Supporters of this hypothesis point to the well developed respiratory turbinates of the glyptodont skull, which are the folded bony structures that warm up and humidify the air entering the nasal cavity while breathing. A heater in your face? Sounds pretty great when you live in the Ice Age. What we do know is that glyptodonts were mighty tasty and now totally dead. 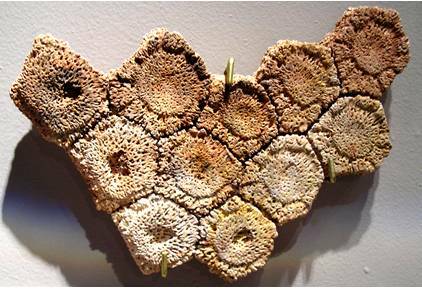 More importantly thought glyptodonts represent the beauty that is mammalian diversity. 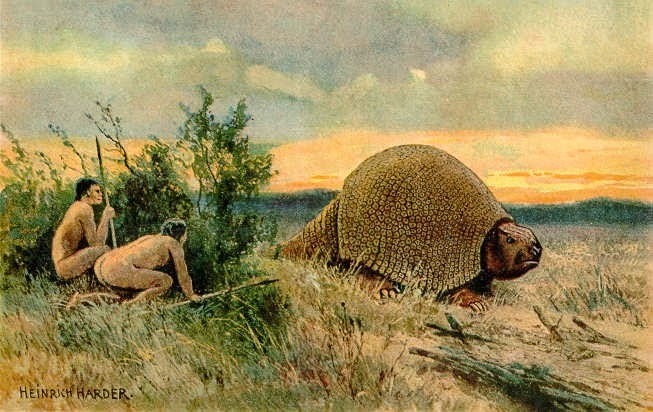 Who knew there used to be mammals that looked like the giant tortoises walking around Pleistocene Texas! Speaking of giant tortoises, Darwin actually found glyptodont fossils while on his journey on the H.M.S. Beagle, which may have influenced his developing ideas on natural selection. It's hard not to get curious about an animal as weird and awesome as glyptodonts, so thank Darwin and go read more about them! To watch some great glyptodont videos check out the BBC website, or watch this hilarious conspiracy theory about life on Mars. Fernicola, J. C., Toledo, N., Bargo, M. S., & Vizcaíno, S. F. (2012). A neomorphic ossification of the nasal cartilages and the structure of paranasal sinus system of the glyptodont Neosclerocalyptus Paula Couto 1957 (Mammalia, Xenarthra). Palaeontologia Electronica, 15(3), 1-22. Gillette, D.D. (2010). "Glyptodonts in Arizona: A Saga of Supercontinents, Sea-floor spreading, Savannas, and Sabertooth Cats. Arizona Geological Survey. Politis, G. G., & Gutiérrez, M. A. (1998). Gliptodontes y cazadores-recolectores de la región pampeana (Argentina). Latin American Antiquity, 111-134.